There are many brands on the market, and our job here is to point out the best for you to make the selection easy and informed. Basically, there are two main types of cast iron cookware. One comes bare, and the other comes enameled. The difference between the two is that for enameled one does not need any seasoning or preventing rust but it lacks the non-stick feature found in bare seasoned cast iron, and it’s also pricier. But, when it comes to durability, the enameled cast iron is a win. Now let’s dig into the best cast iron cookware. This is a multi-functional cookware that you can use to cook all your favorite foods including any slow-cooking recipes. And, the best thing is that you can use it a stovetop, campfire, or an oven. You can also use it to slow-cook your foods without scorching. Again, the cookware retains heat well thus enabling you to sear meat even at higher temperatures while keeping your meals warm for a longer time. They are also indestructible meaning they will last for a long time whether they are used in camps or kitchen. 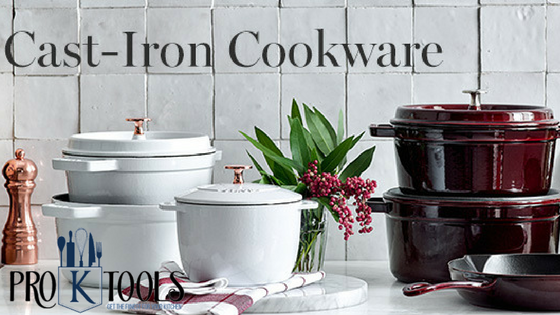 Another thing to like about this cookware is that it’s made of high-quality cast iron meaning it will distribute the heat evenly for even cooking of whatever food. Also, its color, black, makes it blend well in most kitchens and it’s also a good source of nutritional iron. The surface is also nearly non-stick so cleaning up after cooking will be quick. The manufacturer uses a soy-based vegetable oil thus anyone allergic to soybean oil cannot use it. However, you can strip and re-season it. The extra effort is worth it as it’s affordable, easy to care for and excellent in cooking. This is another 5pc cast iron cookware that includes 2 skillets, 1 Dutch oven, 1 Lid, and 1 Griddle. The skillets are 8 & 10 inches big, and the grill is reversible while the Dutch has legs but can still be used on a stovetop. Each of these pieces is well built and will serve you for many years. The maintenance is no different from any other cast iron cookware so you have to put in more effort to ensure that it serves you as it should. Everything will taste better when cooked in this set of cast iron cookware. However, you pay the price of oiling and seasoning each piece as often as you find necessary, but it’s totally worth it. This Cast iron Cookware set includes a 10” fry pan, 10” Dutch oven, 3quart chicken fryer with a lid, cast iron hot handle holder, and Dutch oven lid lifter. It is a really versatile set that you can use for cooking just anything. It makes a perfect choice for your outdoor kitchen. The construction features durable cast iron. Thus it evenly distributes the heat even if you’re cooking on an open fire and it also has a heavy and well-made cast iron lid that keeps your food moist throughout the cooking. Again, the surface is super easy to clean and will keep your food warmer for a long time thus can’t be compared with any ordinary pans or pots. If you want to add some color to your kitchen, then this 6-Quart enameled Dutch Oven is the way to go. It’s available in different colors, so you get to go by what you prefer. It is an excellent choice for cooking, refrigerating, marinating, and freezing. You can also use it in the oven, on gas, induction cooktops, electric, and ceramic. It is however not for use over open outdoor flames or on outdoor grills or microwaves. It has a porcelain surface thus no need to season cast iron. Again, because of the cast iron, it has an excellent heat retention and distribution, to cook your foods evenly and keep them warm longer. This also means that it significantly reduces the energy needed for cooking. And, because it features three layers glossy and very hard porcelain enamel, it is chip resistant plus easy to clean and dishwasher safe although hand washing is recommended so as to maintain its original appearance. Overall, cast iron cookware performs much better than any ordinary cookware plus they are also very durable and can be passed over generations. With proper maintenance, you will love every meal you cook with them. Seasoning them every so often is important to prevent rusting.